Your beautiful home or business no longer feels like the one you knew. Fire damage, soot stains, and lingering odors transform your beloved property into a seemingly contaminated area. It can be devastating to see so much damage done to a property you’ve invested so much time, money, and energy into. Moreover, it’s overwhelming to imagine the time, money, and energy that go into putting things right again. Don’t worry. A bright future is closer than you think. The right fire damage restoration company can make your home or business better than new. And the process is faster and easier than you might imagine. 911 Restoration of Northern Virginia offers comprehensive fire damage restoration services. Our highly trained technicians take care of everything, from odor and smoke removal to structural repairs. Did the fire hoses flood your property? No problem. The same professionals who handled fire cleanup can also manage water damage restoration. 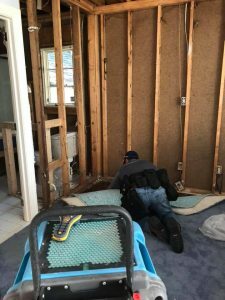 They’ll even inspect for mold resulting from water damage and cleanup any infestations they discover. Fire damage is never simple. Oftentimes, one damage leads to another which leads to another. The friendly staff at 911 Restoration understand how paralyzed many property owners feel after a fire. That’s why they work diligently to oversee every aspect of the damage, so you never have to worry about managing additional contractors. With 911 Restoration, you can find all your answers in one place. Consider us your Fire Information Center. Your dedicated fire damage restoration technicians have one central goal: to bring you peace of mind. This means they leave no stone unturned, leave no question unanswered, and leave you with a fully reconstructed and renovated home. At 911 Restoration of Northern Virginia, we believe the worst moments in life are the best opportunities to create a Fresh Start. Call today and let us find the Fresh Start in your property incident. Fire damage is often extensive and complicated…which means you need a fire damage restoration company that’s prepared to handle all aspects of your unique situation. You also need someone who communicates clearly every step of the way, so you’re never left in the dark about your needs or the health of your property. 911 Restoration is that company. The expert fire cleanup technicians are open and honest with you at every moment, starting with your free fire damage assessment. They are also thorough, focusing not just on fire cleanup, but on total property restoration. They use sodablasting to remove smoke, soot, and ash left behind by the fire or puffback. This technique is especially important for accomplishing permanent odor removal, as odor lingers as long as smoke and soot particles are left behind. Your friendly fire cleanup team will see to it that odor is a non-issue. Fire cleanup doesn’t end with the structures of your property. The technicians even clean your furniture and dishes. They pack out and store any belongings that could be at risk of being damaged during the fire cleanup process. If the fire hose has flooded your home or business, our IICRC certified technicians handle water removal and structural drying. They inspect for resulting mold and, should they find any, remove the growth carefully and quickly. Finally, they repair all damages left by the fire. 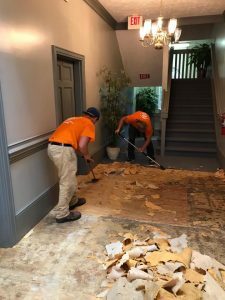 It doesn’t matter what your needs are—roof repair, carpet replacement, flooring or drywall repair—they rip out the damage and replace it with brand new structures and surfaces. By the time the technicians at 911 Restoration are done with your property, you’ll have a home or business that feels as promising and inviting as the day you bought it. Things may look bleak now, but call 911 Restoration of Northern Virginia and see things turn around faster than you ever expected. What fire damages does your insurance cover? If you don’t know, don’t worry. Most people aren’t really sure what coverage to expect after a property fire or puffback, because they frequently require a wide variety of services. 911 Restoration can help you through this headache. Friendly staff members offer a free insurance consultation. They review your insurance policy and help you understand your benefits. Then, they stick with you through the entire claims process, helping with claim filing, inventory listing and loss itemization, and billing your provider directly. Our staff has witnessed the aftermath of many property fires and puffbacks, both as professionals and as human beings. Your fire cleanup specialists understand what you’re going through, and they want to do everything they can to help you get back on your feet with as little pain as possible. 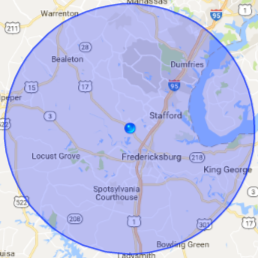 If you need fire or smoke damage restoration in Stafford, Spotsylvania, Woodbridge, or the surrounding area, contact 911 Restoration of Northern Virginia. We’ll take the burden off your shoulders so you can stand tall again.